I've been doing KTVA for a while now and am working on Volume 3, however I find it impossible to sing the exercises lightly as Ken does on the demonstrations. Does headvoice have to be strengthened and stretched downwards into the chest registration area before this light vocal production can be made? Yes. You need to work on your head voice, and bringing it down low, at least to your primo passaggio, even lower if you can. That's the soft component that also can go high. The other part of the equation it the stretching of chest voice and the thinning, or "paring-down" of the chest voice tone as you go up to your chest limits. 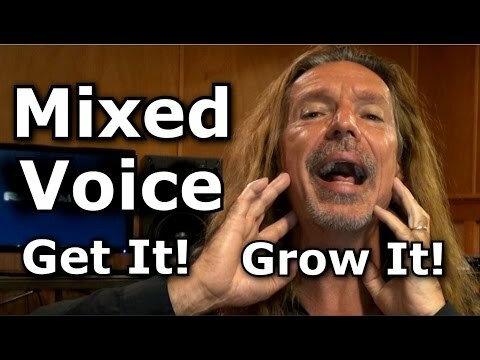 That in-between area, from the lowest you can go in head voice to the highest you can go in chest voice, is where you can potentially use a blend of chest and head to get a voice that is softer than pure chest voice, and stronger than pure head voice. If you have the PRO Bundle, then you have the Building Head Voice program and you also have PRO Access to the Forums (after you apply for it) where there are videos on Mixed Voice. If you're doing your KTVA workouts properly, you are doing TWO forms of the workouts every day. One time where you allow your voice to bridge into head voice. The other time, you don't allow your voice to bridge, but instead you remain in chest voice, and stretch the chest voice as high as you can. The reason you do the workouts both ways is to A: Develop your normal head voice and learn to bridge, and B: Develop an extended chest voice. Then after Volume 3 you do the Head Voice program and further build an extended head voice. Finally, after the head voice program, you add the mix skills. That gives you more flexibility with ranges of volume, dynamics, and tone textures in that area between mid chest and head voice. The exercises Ken is showing in the first video you posted are good for building agility through that range at a low volume. There are also sliders in Volume 2 that help with this. Also the audio exercises from Volume 3 where Ken says to bring the chest voice all the way up into the head voice, those are kind of fusing chest and head into the same space, as well, but those are more intense exercises as opposed to softer singing. So, hopefully that gives you some answers to your questions. But doesn't working on headvoice and bringing it down below primo passaggio at this stage of development (i.e. during Volume 3) contradict Ken when he says to stretch the chest as far as possible BEFORE working on headvoice and stretching it downwards? Wouldn't it be better to work solely on stretching chest (i.e. loud belting) until volume 3 is complete and then do the Building Headvoice pack? YES. You do the Head Voice program ONLY after Finishing Volume 3. So you probably won't be able to do those exercises as lightly as Ken does, except in a soft head voice, until later on. You don't do the Mix Lessons until AFTER you've done the Head Voice Program. Ken did all of this long ago. So it's easy for him to do it in his well-developed mix voice. You should be doing BRIDGING on your Volume 3 exercises one time and STRETCHING CHEST on a second pass. You need to have an option to bridge available to you, or you will have nowhere to go when you do reach your high limit. And you don't want to have to learn to bridge later, because that can become a stumbling block for you, too. Do your exercises twice daily. Once bridging, once stretching chest. It's OK if you don't have time to do ALL Of the exercises two times. Just alternate between bridging and stretching, or do the first half of the exercises while bridging and then the same half of the exercises when stretching chest, and the next day do the other half the same 2 ways. Any way you want to do it, but just BALANCE the LOAD as far as continuing to develop your chest-stretching capacities and maintaining your bridging skills and venturing into default head voice. You don't want either of these skill sets to atrophy. 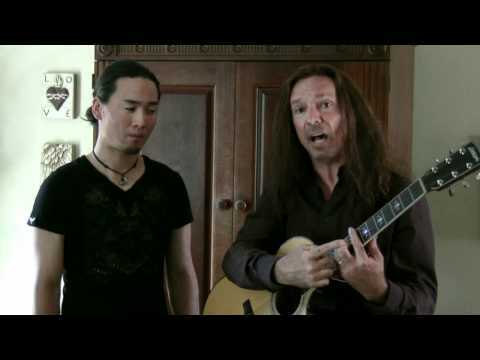 You will NEED a STRONG, experienced and developed Passaggio (bridge) when it's time to add your Timbral Head voice and later to fuse the head voice and chest voice into Mixed Voice.